Former supervillain Gru and his former enemy, Lucy, have settled into life as the married, adoptive parents of Margo, Edith and Agnes, and as members of the Anti-Villain League. When he fails to capture child star-turned-villain Balthazar Bratt, Gru is fired from the League. 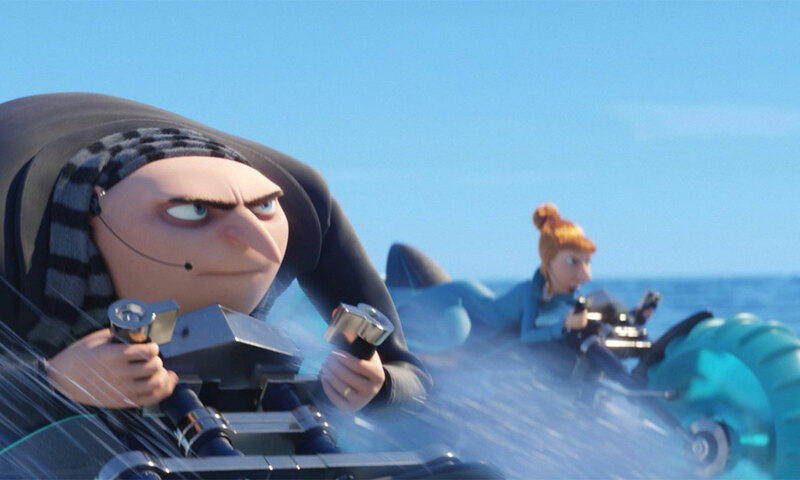 Gru’s family is supportive – his youngest, Agnes, even sells some of her toys to try to raise money to replace his salary – but his Minions desert him. An unexpected visitor summons Gru to meet with his long-lost twin brother, Dru. 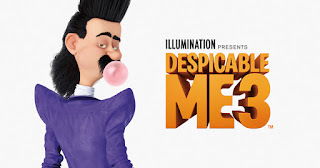 Dru admires Gru’s legendary works as a supervillain, and hopes to learn the family trade from Gru; Gru has given up on villainy, but thinks he can team up with Dru to defeat Balthazar Bratt and regain the favor of the Anti-Villain League. Gru learns that his parents split up shortly after he was born, and that he has a twin brother. Each was kept secret from the other; Gru’s parents wanted nothing to do with each other, and each agreed to take one of the children. Apparently, each parent degraded the child they kept and idolized the child they lost. 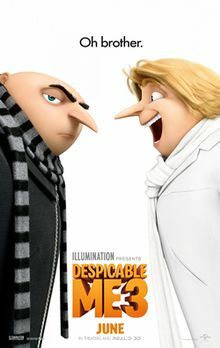 Gru is intimidated by his brother’s financial success, while Dru was not able to live up to his father’s standards of supervillainy, and looks to learn from Gru. Lucy acknowledges that she’s learning how to be a mom; her first attempt at trying to be stern with Margo backfires, but when she sticks up for Margo, Margo responds by spontaneously hugging her. This reminds me of watching Gru learn how to be a sensitive, nurturing father in Despicable Me 2. Gru’s mother says some very cutting things to him about him being a disappointment. 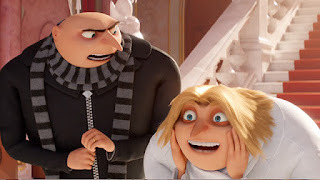 Gru is surprised to find out that his father has only recently died, because his mother “told me dad died of disappointment when I was born.” Gru is overjoyed to find his brother, and learns that although his mother has despised him, his father was proud of him. A series of photographs shows Gru and Dru as infants being torn away from each other; this could be hard for kids who have unresolved grief over separation. In the midst of a spat, Gru and Dru declare that they are no longer brothers. Gru tells Dru, “No wonder Dad thought you were a failure.” They do reconcile, but it’s sad to see these long lost brothers so quickly turn towards excluding each other. (Spoiler) Balthazar Bratt disguises himself as the girls’ mother and uses the disguise to kidnap and endanger them. Despicable Me 3 is a fun, mostly kid-friendly story that captures Gru’s strengthening and expanding family. Margo, Edith and Agnes seem fully comfortable with Gru, and Lucy is figuring out how to be a mom. 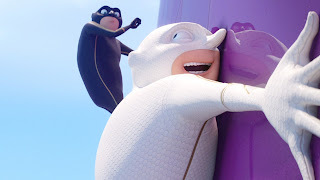 In Gru’s history there are issues of parental rejection and lost siblings, which could be hard for some viewers, and the girls are kidnapped and briefly imprisoned by Balthazar Bratt. 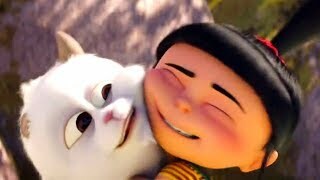 One scene where Agnes takes adult-level responsibility because of her worries about the family’s finances in the wake of Gru’s job loss could be difficult for kids who have experienced intense poverty or neglect. Gru’s response to her is perfect, though. This one should be good for most kids over 8 or 9, although kids with unresolved issues or fears surrounding parental rejection, lost siblings, or kidnapping might do better with another film. What makes Lucy a good mom? What sorts of things are important for parents to know? 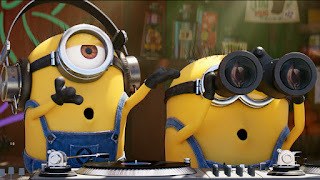 How did Gru and Dru feel when they met each other? When they said they weren’t brothers any more, why do you think they said it? Did they actually mean it? Does Agnes need to worry about her parents’ jobs? She seems worried, but Gru says she doesn’t need to worry; why do you think he said that? Whose job is it to worry about stuff like that?